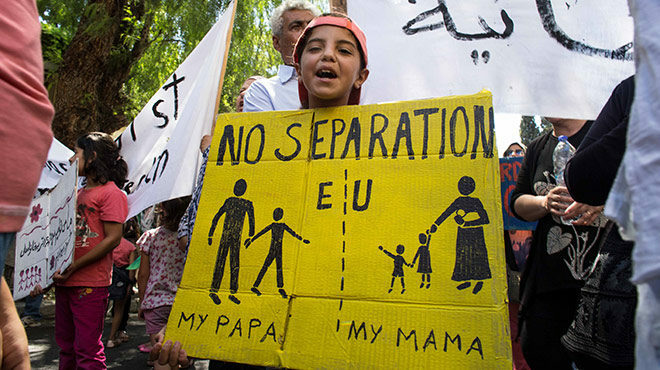 No more separations of families! RSA and PRO ASYL have docu­men­ted dra­ma­tic cases, whe­re even lives have been lost during peri­ods of sepa­ra­ti­on. The­re are still refu­gees who desper­ate­ly fear that they might not see their wives, hus­bands, child­ren or par­ents ali­ve again, as they are wai­ting in lim­bo for an ans­wer to their app­li­ca­ti­ons for fami­ly reuni­fi­ca­ti­on and for their trans­fer to final­ly take place. Mean­while, long wai­ting peri­ods in Greece result in more anguish for alrea­dy vul­nera­ble pro­tec­tion see­kers, and poor recep­ti­on con­di­ti­ons are lea­ding to a dete­rio­ra­ti­on of the phy­si­cal health of many refu­gees and in some cases even seve­re inju­ries. The fami­ly of Abda­la A., a 44-year-old man from the IS-held town of Al Asha­rah (Deir Ezzor pro­vin­ce) in Wes­tern Syria, reached the Greek island of Chi­os on March 17th, 2016 –short­ly befo­re the imple­men­ta­ti­on of the EU-Tur­key State­ment and new restric­tion on thousands of refu­gees who could no lon­ger lea­ve the Aege­an islands. “We escaped from Syria becau­se of the war and becau­se we wan­ted our child­ren to stay ali­ve. We alrea­dy had lost four child­ren: Three died of heart pro­blems and one due to a weak liver. Bombs fal­ling in the neigh­bou­ring houses, the sound of the war pla­nes fly­ing clo­se over our heads, the lack of doc­tors and medi­ci­ne… the­se pro­blems were not beara­ble for us – even more due to the health pro­blems of our kids,” says Abda­la. His oldest (but still underage) son had left Syria ear­lier with his uncle. They reached Euro­pe, app­lied for asyl­um in Ger­ma­ny in Decem­ber 2015 whe­re the child was gran­ted refu­gee sta­tus in March 2016. When the rest of the fami­ly reached Greece, they were with a three-month-old baby who was suf­fe­ring from a serious heart con­di­ti­on (myo­car­di­al disea­se), which had not been dia­gno­sed yet by that moment and a six-year-old girl who suf­fers from a kid­ney disea­se (nephro­pa­thy), as well as their two other child­ren. Along with hund­reds of other refu­gees they were evacua­ted from the islands befo­re the imple­men­ta­ti­on of the EU-Tur­key Deal. The fami­ly as trans­fer­red to Kats­ikas camp, which at that time was offi­ci­al­ly cate­go­ri­sed as one of the “emer­gen­cy accom­mo­da­ti­on sites”. Kats­ikas camp is loca­ted in Nort­hern Greece, near Ioanen­na. The army-run tent camp was built on peb­b­le stone ground. During the first days the­re was repor­ted­ly no elec­tri­ci­ty and thus no light at night. The­re were not even plastic she­ets on the floor of the tents. Accord­ing to activists, UNHCR ent­e­red the camp more sys­te­ma­ti­cal­ly only in May to pro­vi­de basic pro­tec­tion mecha­nisms, and in July a few NGOs fol­lo­wed to offer legal advice and aid. Pri­ma­ry medi­cal aid was pro­vi­ded initi­al­ly only by the Hel­le­nic Army, which sin­ce mid-April, repor­ted­ly had only a spo­ra­dic pre­sence in the camp. Refu­gees who requi­red medi­cal atten­ti­on had to refer them­sel­ves to the alrea­dy over­bur­den­ed public health sys­tem, wit­hout inter­pre­ters and with a wai­ting time for an ambu­lan­ce which fre­quent­ly excee­ded 30 minu­tes. Only in May 2016, NGOs star­ted to offer pri­ma­ry health care and medi­cal aid for refu­gees with chro­nic disea­ses or men­tal health pro­blems. “Ever­ything in Kats­ikas was a pro­blem,” the father said about their living con­di­ti­ons during the first mon­ths in Greece. Later, in the sum­mer of 2016, a rep­re­sen­ta­ti­ve of an orga­ni­sa­ti­on repor­ted­ly told the fami­ly that they would not have to app­ly for fami­ly reuni­fi­ca­ti­on through Dub­lin III, as they had alrea­dy app­lied for the fami­ly reuni­fi­ca­ti­on pro­ce­du­re at the Ger­man embas­sy. Despi­te the family’s medi­cal histo­ry with a high child mor­ta­li­ty rate and the four small child­ren they were not trans­fer­red to bet­ter accom­mo­da­ti­on until Novem­ber 2016, when their then 11-month-old baby had to be trans­fer­red first to Ioan­nena hos­pi­tal and then to the children´s hos­pi­tal in Athens with an air ambu­lan­ce. Until then they were stay­ing in a tent – for a total dura­ti­on of eight mon­ths. Accord­ing to the fami­ly, they were not inclu­ded in the UNHCR accom­mo­da­ti­on sche­me as they were neit­her relo­ca­ti­on app­li­cants nor asyl­um app­li­cants. On Novem­ber 18th the fami­ly recei­ved sho­cking news. Only one week befo­re the child had to be trans­fer­red as a case of emer­gen­cy to the hos­pi­tal, the family’s visa app­li­ca­ti­on had been ans­we­red – in part posi­tively but in part also nega­tively: The par­ents recei­ved visas, but the child­ren did not. One week later, the baby had to be trans­fer­red to Ioan­nena hos­pi­tal, whe­re she had alrea­dy been trea­ted twice befo­re and from whe­re she had always been sent back to the camp after tre­at­ment wit­hout any fur­ther noti­ce of a seve­re heart defect. On Novem­ber 26th, she and her father were trans­por­ted to Athens and she was hos­pi­ta­li­sed in the children’s hos­pi­tal. At the begin­ning of Decem­ber, the mother who was pregnant again, and the remai­ning three child­ren also arri­ved in Athens, whe­re the fami­ly was accom­mo­da­ted in a hotel fun­ded by the UNHCR accom­mo­da­ti­on sche­me. While the mother herself sent a let­ter of appeal against the rejec­tion of the visa app­li­ca­ti­on of the child­ren, on Novem­ber 29th the par­ents’ visas were issued at the Ger­man embas­sy in Athens; howe­ver, the mother’s appeal was rejec­ted in mid-Janu­a­ry 2017. The mother left Greece and ent­e­red Ger­ma­ny in mid-Janu­a­ry 2017, whe­re she app­lied for asyl­um at the end of March and was gran­ted refu­gee sta­tus in May. The father remai­ned in Greece with the four child­ren, two of whom were sick. The baby was released from the hos­pi­tal, and a few days later the father, try­ing to find a solu­ti­on to join his wife and son in Ger­ma­ny and to find ade­qua­te medi­cal help for the sick baby, final­ly went to the Greek Asyl­um Ser­vice and asked for an appoint­ment to app­ly for fami­ly reuni­fi­ca­ti­on. On March 7th, 2017 the father and the four child­ren final­ly app­lied for fami­ly reuni­fi­ca­ti­on. In a medi­cal cer­ti­fi­ca­te dated March 28th, the direc­tor of the car­dio­lo­gi­cal Children´s Cli­nic sta­ted that the baby was hos­pi­ta­li­sed due to “non-com­pac­tion car­dio­myo­pa­thy”. He fur­ther recom­men­ded that for the necessa­ry medi­cal care of their child the par­ents would have to under­go trai­ning, and exp­lai­ned that the strict obser­van­ce of a ste­ri­le envi­ron­ment and con­stant alert­ness would be necessa­ry. The child would need both par­ents’ 24-hour care. Fur­ther­mo­re, accord­ing to the doc­tor, the baby was in urgent need of a heart trans­plant, a medi­cal inter­ven­ti­on that is not car­ri­ed out in Greece, and for which she would have to be moved to ano­t­her coun­try. After the baby´s emer­gen­cy trans­fer to the children´s hos­pi­tal in Athens at the end of Novem­ber 2016, the baby was hos­pi­ta­li­sed repeated­ly, and – for a total peri­od of five mon­ths – was at the hotel with her fami­ly only for a few days. Her father was at her side in the hos­pi­tal while the other three child­ren remai­ned in the hotel with fami­ly fri­ends. „I alrea­dy lost four child­ren. I can­not lose ano­t­her one. I want my child­ren to be healt­hy and to live. S. needs to be trans­fer­red to Ger­ma­ny quick­ly so she can sur­vi­ve. I don’t know what to do to help her. Plea­se help me to get her the­re fast“, the despe­ra­te father said. Wit­hin only a few days of recei­ving the medi­cal cer­ti­fi­ca­te from the doc­tor, the Greek Asyl­um Ser­vice sent a request for trans­fer to Ger­ma­ny, to which Ger­ma­ny replied posi­tively on May 3rd. Sad­ly, howe­ver, one day after that hap­py news was recei­ved, the baby pas­sed away at the children’s hos­pi­tal, to whe­re she had been trans­fer­red again. After S. was buried in Athens, the Greek Asyl­um Ser­vice infor­med the app­li­cants that the Ger­man aut­ho­ri­ties had sud­den­ly redu­ced the num­ber of trans­fers of fami­ly reuni­fi­ca­ti­on app­li­cants from Greece to 70 per­sons per month. The father and the three child­ren app­lied again for fami­ly reuni­fi­ca­ti­on befo­re the Ger­man embas­sy on June 19th, 2017, in the hope of being able to rejoin their fami­ly fas­ter through this way. call for the respect of the best inte­rest of the child during fami­ly reuni­on, and the pos­si­bi­li­ty for underage sib­lings of minors living in Ger­ma­ny to join their par­ents and to be trans­fer­red tog­e­ther.